There are several types of radish, but they can be divided into summer and winter crops. They can be ready for harvest within a month of planting, and are often used to mark out rows for other plants, or to teach children gardening as they are a very no fuss. To ensure a sweet, flavorful root the radish should be grown fast and undisturbed. 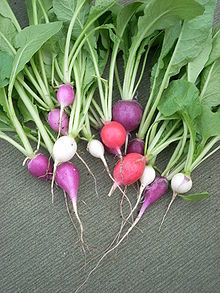 Radishes are also known as Daiken in some parts of the world. 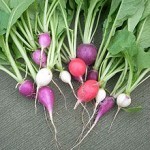 Summer radishes are planted in January and February and harvested in March through June. An all red globular radish that is very popular. It is crisp, mild and white on the inside and can remain in the ground for a longre time before losing its flavor. Like the Cherry Belle radish, but matures slightly faster. Also popular. Globular; all-red. This is a modern radish bred for the claims of producing a large root that keeps it flavor as it gets larger. A pink globe used for adding color to salads. A cylinder/egg shaped root that makes crips and mild roots if harvested when tender. One of the most popular of all radishes. Long and white crisp and nutty flavored roots that mature in only a few weeks to harvestable size. Winter radishes take 2 or 3 times as long to harvest because plants grow slower when it’s cold. As such, they have a sharper flavor than summer varieties. About 5 inch long and 2 inches wide. Skin is deep rose and the inside is a crisp and white. a Foot long root that is milder than some of the other winter varieties. There are two varieties, long and round. Both are black skinned and white flesh. The long grows up to one foot long and is shaped like a parsnip. In most radish plants, the root is the edible part, but there is one, the Munchen Bier where a large leafy stalk is eaten instead of the root. Here are some of the claims that are benefits and uses of radishes that I was able to find. Jaundice – leaves and roots are good for the liver and stomach and as a general blood detoxifier (black varieties). Urinary/Kidney Infections – because radishes increase urine production and reduce inflammation and burning during urinating, this is a natural remedy. Skin Disorders – there are several minerals and vitamins that are good when radish pulp is used as a poultice directly on dry skin, rashes and cracks. A face mask made of radish pulp will help detoxify pores. Cancers – radishes have high levels of anthocyanin, folic acid and vitamin C and are said to be good for many types of cancer, but in particular colon, kidney, intestines, stomach and oral. Weight loss – radishes are filling without giving very many calories. They are high in water and roughage and low in carbohydrates. Constipation – radishes are high in roughage and water and is a good detoxifier. The juice soothes the digestive system. Insect Bites – The juice helps reduce swelling and pain in bee, wasp and hornet bites and stings. Fever – the anti inflammatory properties of radish juice mixed with salt are said to reduce fevers. Radishes are planted a few inches apart either as a row marker (as they will be harvested within a month), or under glass if too cold. For a continual supply, plant summer varieties every few weeks in January through March or when the soil temperature is greater than 46F. Winter varieties can be planted from September through December. Radishes are a very easy to grow vegetable that requires little attention aside from fertile soil to start with. In aquaponics, the bulb might rot if the grow media is constantly wet. To remedy this, make sure you have a dry zone where the radish will grow. Nasturtium and mustard release a protective oil that helps radishes. All of the cabbage family should not be rotated with radishes (cabbage, cauliflower, brussels sprouts, broccoli, turnips). Leaf Lettuce makes radishes more tender. Do not grow radishes near Hyssop. The best temperature to plant Radishes are soil temperatures between 46F and 86F, though different varieties can take more cold. Each variety has a different harvest time. The longer most radishes stay in the ground, the more woody and dry they become. Read the specific seed instructions for the variety you wish to grow and harvest while still tender as per the instructions. Store radishes in a plastic bag in the refrigerator for up to a week. It is common to eat radishes as a salad garnishment, or raw (washed) with butter, bread, and a strong drink as an appetizer. Previous post: Which Crop is Most Valuable?